Hello everyone! 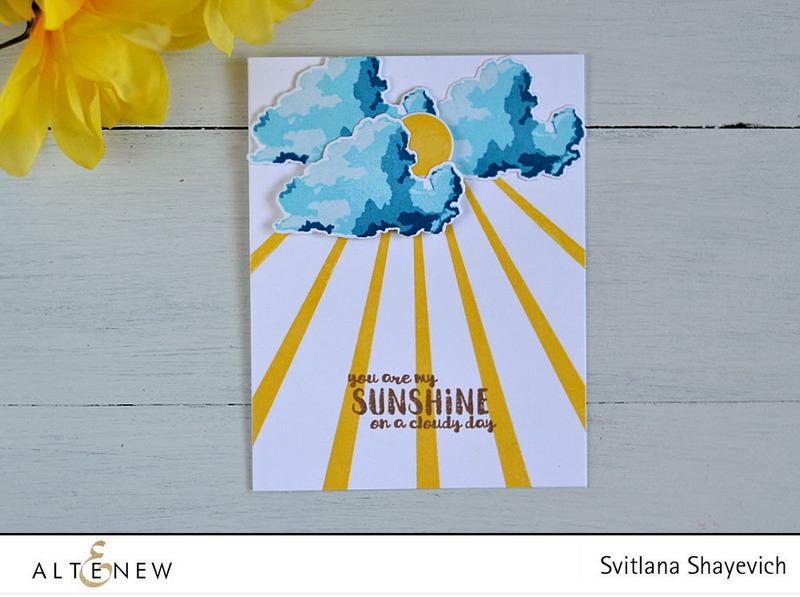 Svitlana is here today focusing on the Rain or Shine Stamp Set from the new release. I should confess. I’m not really a weather card person. Flowers are more my thing. I don’t think I ever made a card weather related. Well … until now! With this set I had a blast and all I want to do now is weather cards. When I saw it immediately fell in love with it. This is a bigger set (I personally love big stamps), suitable not only for cardmaking but for scrapbook and other bigger projects. It has such realistic images, that can be used not only for weather cards. As usual I’ll be sharing three cards made using this set. The first card is more traditional I’d say. Clean and bright. To start off I stamped sun rays onto an A2 card base made out of Solar White Cardstock using Warm Sunshine Crisp Ink. Then I stamped the Sun, using Mango Smoothie Crisp Ink first, and then adding dimension by stamping over with Warm Sunshine Crisp Ink using rock-and-roll technique. After that the Sun was die cut using the matching die from Rain and Shine Die Set. I stamped three clouds using Sea Glass, Ocean Waves, Desert Night and Dusk Crisp Inks and also die cut them using the matching dies. 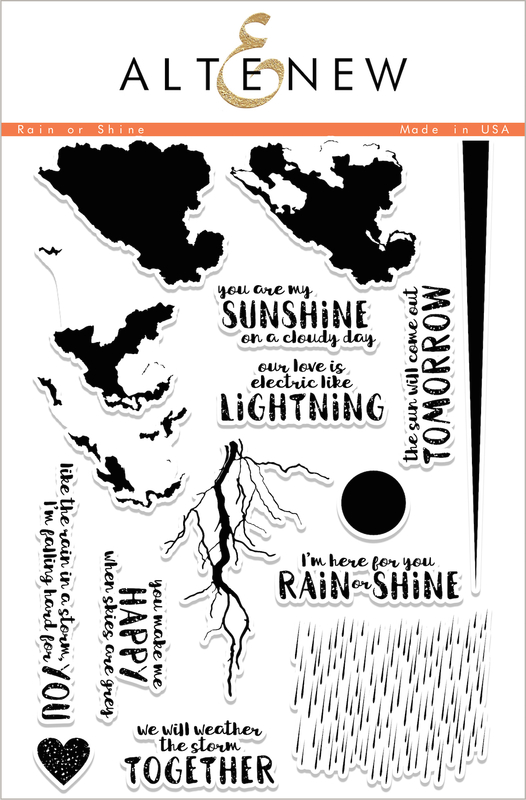 I stamped the sentiment from Rain or Shine Stamp Set using Mocha Crisp Ink. Lastly I assembled my card by adhering the clouds and Sun. I foam mounted all elements, using both thin and regular foam squares, to add multi layer dimension to my card. The second card is my favorite from these three. Here I was trying to make as realistic storm scene as possible. Which was so easy to do having such realistic stamps. 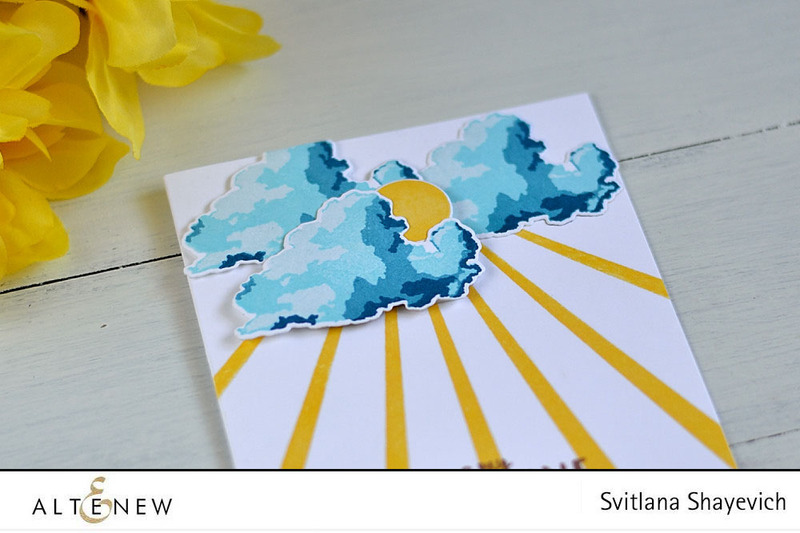 First I stamped the clouds in the top part of a Solar White cardstock panel. I was using Soft Lilac, Lavender Fields, Deep Iris and Midnight Violet Crisp Inks for the lighter cloud and Lavender Fields, Deep Iris, Midnight Violet and Jet Black Crisp Inks for the darkest ones. Also I stamped the “ground” in the bottom part using Jet Black Crisp Ink and the bottom most solid layer of the cloud. I inked the whole panel using Deep Iris, Midnight Violet and Jet Black Crisp Inks , making my inking darker on the sides. Next I put my panel aside for a couple of hours to let ink dry completely. You can use a heat gun if you don’t want to wait. I usually don’t want to spend time on this and prefer it to just air dry, while I’m working on some other project. After it was completely dry I white embossed a couple of lightnings… Can we have a moment and talk about the lightning stamp? How cool it is!!! I just cannot stop admiring it. And I see that it can be not only used as a lightning, but also as a spooky tree branches. I already have one Halloween idea in mind using it. Ok, back to the card. Lastly I white embossed the sentiment and foam mounted the panel onto a white card base. I tend to make darker cards more, then lighter ones. But sometimes they can be too dark and too dramatic. To balance the darkness I use a white card base and also cut the panel a half inch smaller from each side. This allow me to still work within my beloved darker color scheme, but have a lighter finished product. My last card is not related to the weather at all. It’s one of the many cases this set can be used for. First seeing this stamp set I immediately saw the marble opportunity in the layers of clouds. Marble textures are so hot right now. If you’re following design trends you know about it. In the past I tried replicating marble texture using watercolor. But I’m not so good in coloring, so wasn’t happy with the result. Plus, I’m more stamping, then coloring girl. And this set is the answer for all my marble desires. To start off I cut and scored an A2 card base out of Solar White Cardstock and stamped the marble background onto it using Limestone, Silver Stone, Industrial Diamond and Pure Graphite Crisp Inks. I was mostly using two middle layers of the cloud to stamp the pattern. I didn’t align them one on top of another as I’d do for the clouds. Instead just stamped in different directions building the marble design. The gold veins were made by gold embossing the top cloud layer. To finish the card of I die cut the sentiment using Thanks Die out of Gold Mirror Cardstock and adhered in onto the card. I didn’t want to add any other embellishments to it, as I wanted my marble design to stand out. Here you have three examples of how the new Rain or Shine Stamp Set can be used. I love all of the stamp sets, specially the Rain or Shine clear stamp set, along with the Family Matters clear stamp set. Cards are all inspiring and beautiful. You are all super creative. Can´t wait to get my first Altenew stamp set! Thank you a lot, Rita! Thank you a lot, Susi! I’m so happy that my cards got your interested in this set. Beautiful cards, I just love how versatile your three cards are! I would have never imagined the marbled look for the background! This set is absolutely on my wish list now! Thanks for sharing your talent with us. Thank you a lot, Kelli! Thank you a lot, Tasnim! This set is absolutely amazing! Absolutely gorgeous projects, I especially love the lightning scene! Thank you a lot, Lagene! Love your cards – especially the lightning one! Initially, I thought the lightning was a branch! Thanks for the chance to win. Thank you a lot, Karenb! Your cards are amazing and beautiful. My favorite is the lightening. Thanks so much for sharing your fantastic inspiration. Thank you a lot, Gilda! Awesome cards!!! Love the purple lightning card!!! Thank you, Maureen. I love this card the most too. It took me some effort to make it, but was totally worth it! These cards are so wonderful! This weather set is on my wish list, but, now that you have shown these beauties… it will fly out of stock. Thanks for sharing your work, lovely as always. Thank you a lot, Anne! OH MY….. STUNNING !!!!!!!! Your cards are all so beautiful, I know you said you don’t do weather cards, well guess what..You DO NOW. YOU ROCK. That purple one was out of this world, it was just AMAZING ! I wanted this set as soon as I saw it as I love to make scene cards. However now that I have seen these fantastic cards I have so many more ideas. Also how you turned clouds into marble is pure genius! Thank you a lot, Bonne! GORGEOUS cards, love all the different looks! Wow this is so cool. Really different stamp set and I love it. So many awesome sentiments can work with this beautiful background. It’s on my wish list. Thanks for showing these beautiful cards. I’m so glad you liked them. Thank you, Billie! I looked past this set during the release but wow! Your cards are making me think again! Love the stormy card the most! Thank you, Tammy! It’s a great stamp set! 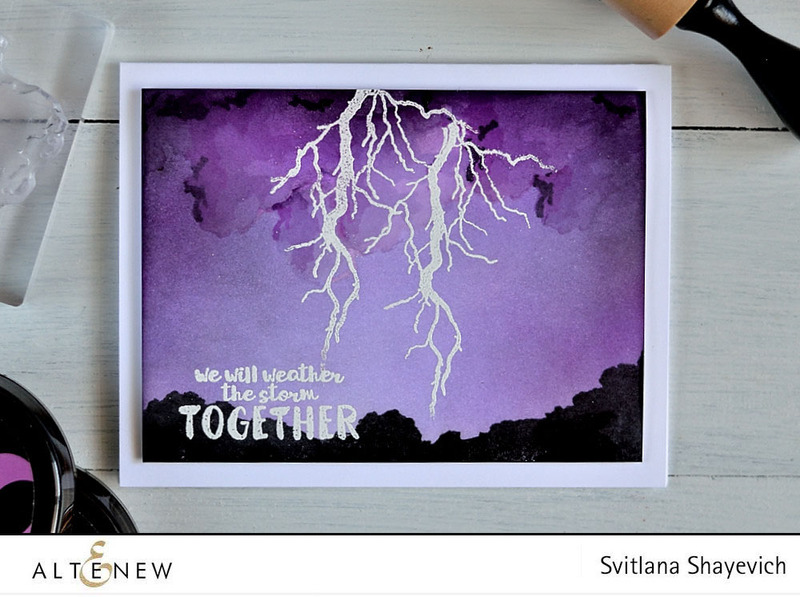 Those are great cards, you are amazing, Svitlana! 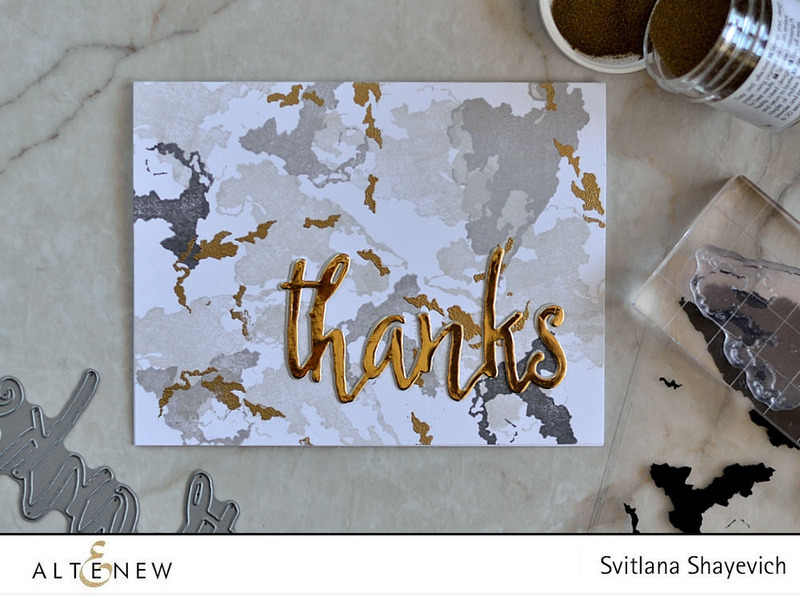 Svitlana, I LOVE your faux marblized card! It is fantastic! Thanks for sharing. Amazing how realistic the lightning card is. Love is stamp set. Thank you a log, Geri! 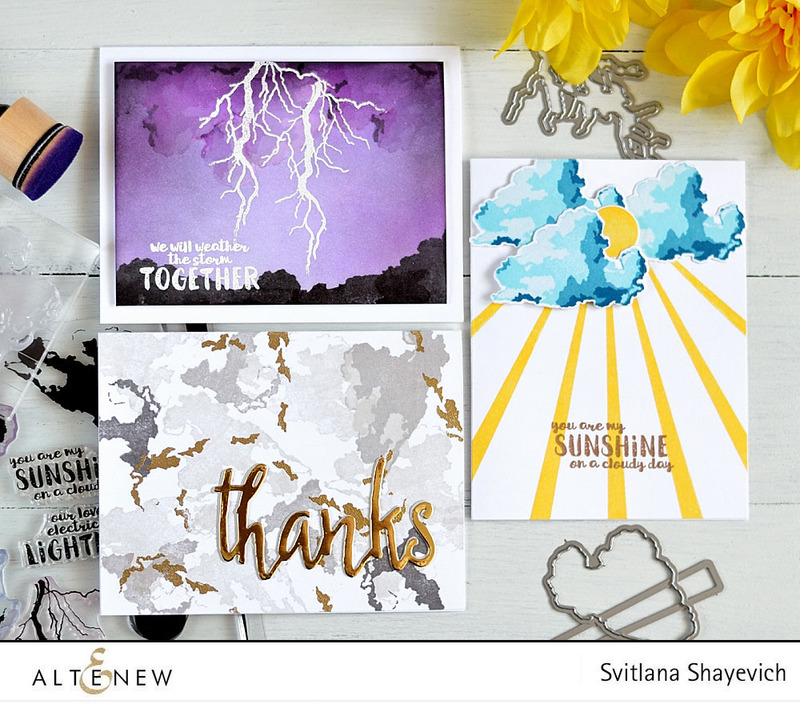 Love the rain or shine stamp set and the amazing card designs!!! Thank you a lot, Patty! Thank you for the beautiful cards! I am in love with this set because it is so different from what is presently available in the stamping world, and the sentiments are brilliant! Thank you a lot, Jan. You’re right, this set is absolutely unique! My favorite is the one with the lightening because it looks so real. I love cards that look realistic. I also love the card with the sun and the sun rays on the card because they are my favorite color, yellow. I just had to comment on these beautiful cards! As soon as I saw this post I rushed over to the shop and placed my order for the stamps and dies! My order is on its way to me and I am totally excited to get it! Thanks for giving me a new look at this set! It’s such a pleasure to read this. I think this set is must have. Have fun playing with your new goodies! These are such great cards Svitlana. The lightning card is so realistic. I love the touch of white to lighten up the dark card. I also love the innovative way you used the stamps to create the ground and the marble background. Really beautiful work!